« Deck The Halls With Greed & Sorrow, Santa Clause-Killing Repubs Are Coming To Town! Congratulations, Virginia! Republican State Attorney General Ken Cuccinelli’s fearless crusade to keep the gubmint’s big, bad, ever-expanding health care paws off the God-fearing, ever-expanding waistlines of the good people of Virginia has finally succeeded…for now. According to the honorable Henry E. Hudson, a federal judge in Virginia who ruled parts of Barack Obama’s signature health care reform legislation unconstitutional, Congress cannot force people to buy health care coverage, especially when you consider how many jalapeño poppers a person can shove down their throats for the same price as a month’s worth of bland, oven baked, not even deliciously deep fried, health insurance. In a 42-page opinion, Judge Hudson ruled the provision of the law that requires most individuals to get insurance or pay a fine by 2014 is an unprecedented & unlawful expansion of federal power that cannot be supported by the Commerce Clause of the Constitution. And it also apparently violates the lesser known Help People Not Unnecessarily Die (Or Go Bankrupt) Clause of the Constitution. Of course, the ruling by judge Henry Hudson, who was appointed to the bench by George W. Bush, has nothing, I repeat, nothing to do with the fact that he is a major shareholder who owns between $15,000 and $50,000 in a GOP political consulting firm that gets paid to argue that health care reform’s individual mandate is a terrible, unconstitutional Socialist threat to the very existence of America. It’s really just that he’s a Republican. Hudson is the first judge to rule that the individual mandate is unconstitutional. He said, however, that portions of the law that do not rest on the requirement that individuals obtain insurance are legal and can proceed. Hudson indicated there was no need for him to enjoin the law and halt its implementation, since the mandate does not go into effect until 2014. Tsk, tsk, silly Hudson! The dumb schmuck doesn’t even realize that thanks to NObama and his terrible Socialist legislation to help poor people and kids with cancer not senselessly die or get fleeced by greedy insurance companies, there probably won’t even be a 2014. Either way, Virginia Attorney General Ken Cuccinelli, who filed the case, one of 25 legal challenges against Obama’s sweeping reform legislation, because affordable health care is for pussies, heralded the Judge’s ruling. 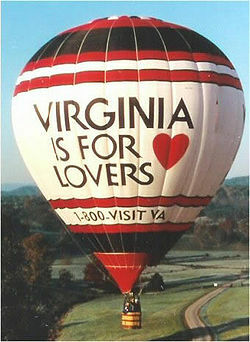 After all, Virginia is for (different sexed, same skinned!) lovers…of denying people health care.